Join the discussion on our forums! Come discuss Reckless Fluff over in our dedicated Reckless Fluff discussion topic. Nice targeted discard. Loving the boost to the archetype! to make sure not to discard the Bloodreaver Gul'dan . Is holding Gul'Dan only, dead next turn if you play Gul'Dan, topdecks this. simple ,just tap to discard the other card . You can finally curve a way to discard the right card you want to discard without having to play your entire hand. Hey Blizz, if you need a Voice Line for this guy, just tweak one you already have for another 3-drop taunt. 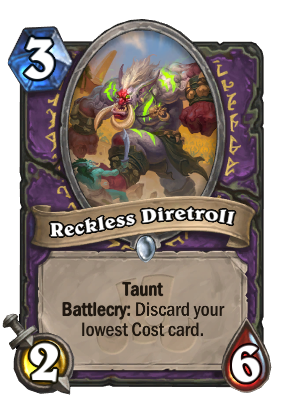 This bad boy's going straight into my Baku Quest warlock! Synergy with Clutchmother or you can just play it on curve and not have to gamble on the discard. Follow this up with Lakkari Felhound for a nice taunt wall. yes, let'S counter the 3-drop with the 6-drop.